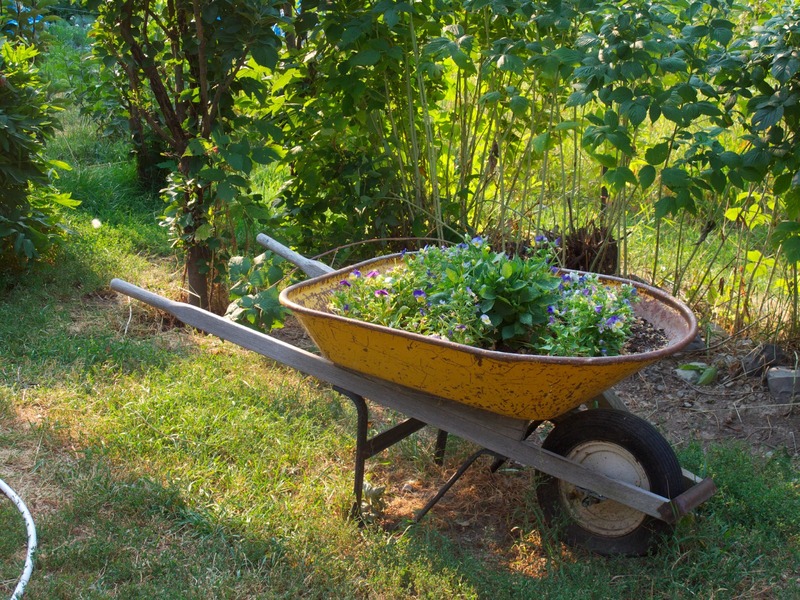 Experiments in modern homesteading... on wheels! If you look at a map that shows the topography of Montana, you will notice a flat depression nestled into the mountains of the state's north-west corner. It's like some giant thumb left its mark on the Rocky Mountains long ago. This thumb print is an enormous valley which the locals refer to lovingly as The Flathead. Glacier National Park crowns the north-eastern side of the Flathead Valley and the southern end is defined by the largest natural freshwater lake in the western United States, aptly named Flathead Lake. 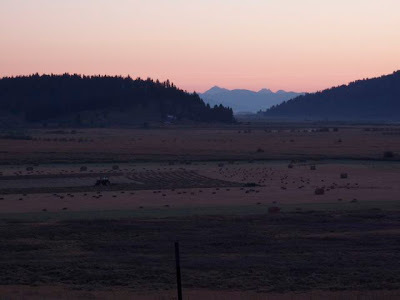 If you head west out of the Flathead you will you soon be confronted by the Salish Mountains, a sea of beautiful forested mountains rolling toward the panhandle of Idaho. The Salish Mountains are largely accessible only via an immeasurable network of mostly defunct logging and Forest Service roads that snake like veins up into the hills. It is on one of these remote roads, very near the top of Wild Bill Mountain that you will often find Ann Keenan tending to her flock of nearly 60 cashmere goats. 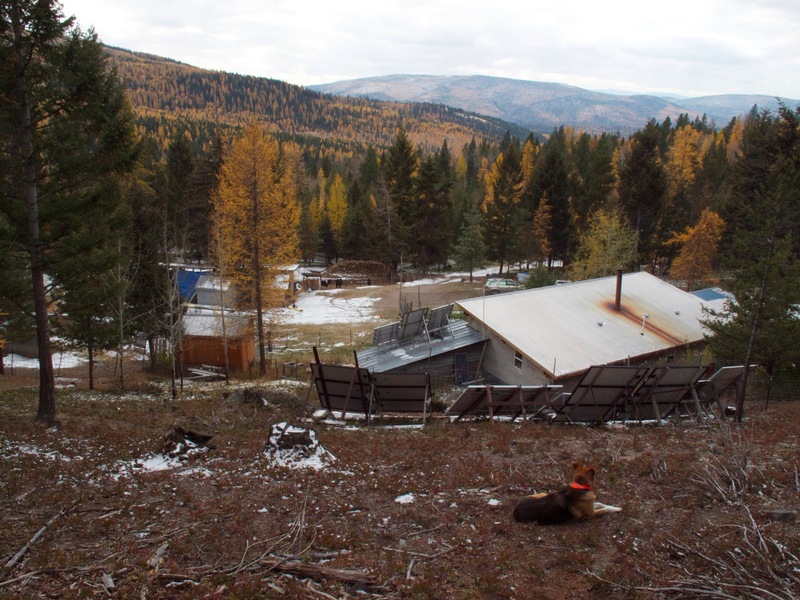 It was here in this remote and idyllic landscape that Ann and her husband John carved out a 20 acre parcel that they now call Pine Needle Farm. It was late in August of 2011 when Heidi and I arrived from Portland, Oregon to Pine Needle Farm in our half baked school bus conversion. Even though we were no strangers to rural and wild places, having settled into the urban lifestyle during the previous four years, I would be lying to say that we weren't a little intimidated by the move. We had been acclimated to a fast paced and social environment where we could find any of life's necessities in a short five to ten minute walk from our home. Pine Needle Farm is no such place. The winding gravel road leading to the farm climbs up, out of the valley and far away from civilization. The closest public building is the Kila (pronounced ky-la) elementary school, where Heidi is currently teaching. It is an arduous half-hour drive from the farm. To get to a grocery store, its best to plan on at least 45mins one-way. The land is tough yet inviting. One might say the same of our gracious hosts Ann and John Keenan. Ann is a commanding woman with soft blue eyes and big smile that seems as though it could warm the Keenan's straw-bale home through the long Montana winter (if only it were that easy). She is the type of person who could milk a goat with one hand, crochet a cashmere afghan in the other and simultaneously prepare a delicious meal in the home's wood-fired oven. Ann's husband John is a slender man, clean shaven and adorned by round rimmed glasses. John has an athletic build that seems made for professional bicycling, which consequently suits him very well. Although he is not actually paid to ride, John is something of a biking legend in these parts. He has worked in a local bike shop for twenty-two years and has made the 40+ mile round trip commute by bike, from mountain to valley and back, on virtually every day that there was no snow. Ann handles most of the farm animals and domestic tasks on the homestead. John takes credit for building the home's off-grid solar power system, gathering much of the ten cords of firewood required for heating and cooking each winter and presides over many of the gardening tasks. In recent years, John has spent much of his time on the East Coast helping his aging parents and taking advantage of a stronger economy to help pay off the farm's debt. This leaves Ann in charge of the farm with an occasional hand from interns such as Heidi and myself. The farm itself is built into the hillside. As you climb the steep driveway through a handcrafted wooden gate you are suddenly surrounded by goat pasture. The pasture is only distinguishable from the forest by a welded-wire fence on its perimeter and its distinct lack of undergrowth. Oregon grape is about the only small leafy plant that the goats will rarely touch and so it thrives in this open preserve under a dense canopy of Larch, Doug Fir, Pine and Aspen trees. Nearing the top of the drive to the east, a large hay barn is perched on one of the few level spots on the property. It is surrounded by smaller goat pens each containing clusters of small shelters built from used pallets and plywood scraps. More than 50 goats mill about doing what goats do best. Eating. During the summer the goats are free to range the twenty acres keeping the forest mowed back and filling themselves like balloons. During the winter when the greenery has long past, they wait eagerly in their pens for the next load of hay to come rolling out of the barn. When the delivery finally arrives they flood in upon it with total indifference to each others spiraled horns and to the poor sap pulling the cart. Having been this person many times now, I would have to agree with Ann that the goats are both the best part of living at Pine Needle as well its greatest challenge. Goats have no lack of personality for better or worse. While some are gentle and personable, others are shy and timid. There are a few who will do absolutely anything to make your life more difficult. These don't usually stick around for very long as they better suited for the crock pot. More than a few times I heard Ann threaten a particularly cantankerous goat with an impending trip to the freezer. While Ann's famous goat roasts are indeed delicious, that is not the primary purpose for the goats on this farm. 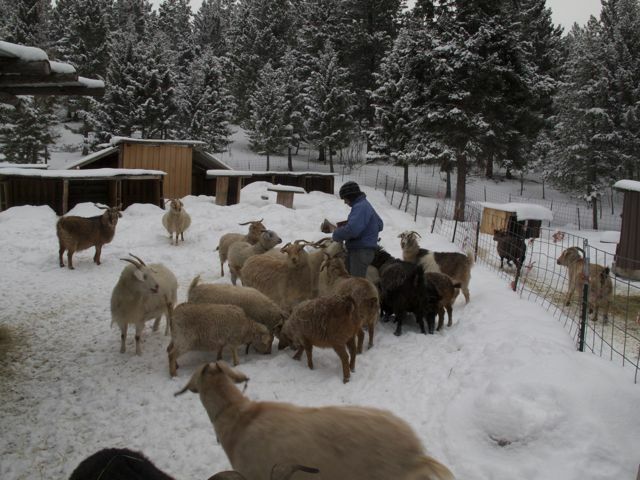 Ann raises cashmere goats which are prized for having some the softest and warmest fiber of any animal on the planet. As Ann puts it, after being spoiled by cashmere, even merino lamb's wool feels course. Every winter, the goats grow a thick wooly coat that keeps them warm and seems to almost double their girth. In the early spring when their cashmere naturally begins to shed, each goat is painstakingly combed, much like grooming a dog, to collect their precious fiber. The color and texture of each goat's fiber varies from one to the next. With a trained eye, Ann can look at a single strand and judge the fibers quality based on the hair's length, thickness and its crimp or waviness. Ann meticulously combs a goat in "full cashmere"
Many would see life on Pine Needle Farm as the quintessential and romantic vision of "the simple life". For Ann, however, life now is far more complex and "civilized" than the humble roots from which the farm first began. When Ann and John first arrived in 1994 the land was completely raw and untamed. All that existed was a rough road leading to a dead-end logging access that had not been used in many years. There was no electricity, no water and no neighbors aside from the resident deer, mountain lions, bob cats, eagles and bears. What the land did provide though was precious solitude and breathtaking views of the surrounding mountains and forests. Despite the clear challenges, Ann and John fell in love with the land and the price was within their tight budget. They quickly erected a platform on which they placed their 16' x 18' canvas wall tent in the early spring of that year. Their plan was to "rough it" in the tent while they proceeded to build a house that summer. As it turns out, it took a bit longer to get their finances together and start building. And so, for three-and-a-half years they lived in the tent, collected water from a spring six miles away, and kept a small wood stove burning continuously to stave off the winter's chill. For the first year they lived illuminated exclusively by candles and flashlights. The following year they built a tiny solar electric system to power one florescent light. Although Ann reminisces about those simpler times, I don't get the idea she would now want to go back and abandon their cozy hand-built home. With its thick straw bale and plaster walls, a large solar array that can easily power most modern conveniences, and large wood burning cook-stove, the Keenans live comfortably off-grid year-round. Instead of hauling water and hand washing laundry, Ann dedicates much of her day to the goats and to her blossoming cashmere business. Both the cashmere business and the goat herd were things that evolved gradually. Not long after building their home, Ann was invited by a friend to look at some goats that were for sale in the area. Ann and John had read a bit about the topic in periodicals such as Countryside Magazine and Mother Earth News and the idea of diary goats intrigued them. That trip with her friend was just the beginning. 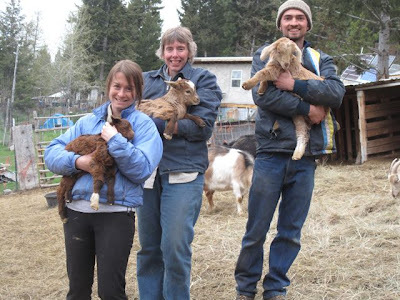 She purchased three dairy goats that day and hurried home to construct a place for them to live. The goats were a good fit for the mountain life since they are useful for clearing undergrowth (a dangerous feature in areas prone to wildfire) and they are well equipped to handle the steep, rough terrain. A few years later Ann took on a small herd of cashmere goats. 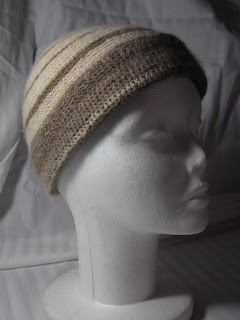 She began to experiment with spinning their luxurious fiber into yarn and then stitching together beautiful crocheted items. Beginning with some surplus goat's-milk soap that Ann had made at her sisters request, she tried selling her goods at the local farmers market. It wasn't long before her display table was also brimming over with hand spun yarn and other cashmere products. Today, the herd is nearly sixty goats strong and the cashmere production line is complete with the acquisition of a "dehairing" machine. This machine is a very large mechanical contraption that consists of a series of rollers and brushes with a conveyor belt that pulls the raw cashmere through it. As the cashmere passes through the rollers, the stiffer "guard hairs" are removed. What remains is only the finest cashmere fibers that fall from the belt in puffy clusters which are appropriately referred to as "cloud". Cloud is the raw material that can be spun into yarn. Ann sells her cashmere as cloud, spun yarn, as well as hand-made crocheted products. Most of the sales from Pine Needle Farm are now sold though on-line outlets including the farm's own website pnfcashmeres.com. Having lived at Pine Needle Farm for eight months, I can attest that the lifestyle, while challenging at times, also produces a bounty of satisfaction. As Ann put's it,"It's a very rewarding life". She even goes as far as considering herself spoiled in a life which is, quite literally, lined with cashmere. You couldn't pay her enough to live anywhere else. Her advice to others who are interested in pursuing a similar lifestyle is to "just go for it". According to Ann, based on her and John's experience, its good to embark on the homesteading journey with some savings for a safety net. She goes on to say that nothing ever goes quite as it is planned anyway, so you may as well jump in without over-thinking it. Judging from Ann's fantastic smile, she just might be right. 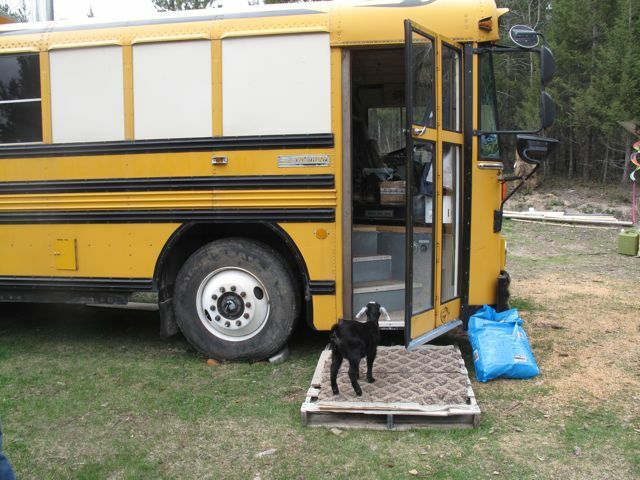 The pros and the cons of living in a goat pasture. Thanks Joan! I hope to do more of these as we travel around exploring new homesteads, farms and other interesting places. Please checking in! How cool is that?! Thanks for the intro to their homestead! 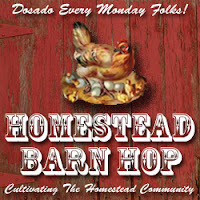 Thanks so much for sharing this on The HomeAcre Hop! Hey Kathy, thanks for the invite. I am not exactly a clever chick, but it wouldn't be the first time that I've been the only guy in the hen house :) Ill drop by one of these weeks if the offer still applies. To Lisa, thanks as always. Amazing project Melissa. I posted a direct link to your blog from our "Living Small" post. Thanks for sharing and keep living the dream! Wonderful piece. I really enjoyed hearing about the farm, and also looking through your blog a bit - what a wonderful life and choice you made! I look forward to hearing more about your adventures! © Copyright 2013 wildbluebus.com. Watermark theme. Powered by Blogger.